Eloquent without being stuffy, authoritative without being didactic. In Japan, trees pervade the physical landscape and have long held a lofty position in the country's spiritual and sociocultural domain. Fittingly, Japanese gardeners have fine-tuned a distinctive set of pruning techniques meant to coax out the essential characters of their garden trees, or niwaki. The approach is calculated and dramatic; niwaki are sculpted to achieve certain effects, from the appearance of maturity to an asymmetrical or even lightning-struck look. Jake Hobson, who honed the techniques in an Osaka nursery before adapting them in West Sussex, England, encourages the reader to venture beyond familiar tree pruning methods to cultivate their very own niwaki. After giving insight into the spiritual concept of "yin and yang" and the deep-seated sociocultural emphasis on balance that underpin the approach, the author details the basic principles of Japanese tree pruning. He goes on to offer in-depth guidelines for sculpting pines, azaleas, conifers, evergreens, bamboos, and deciduous trees. He also places Japanese tree pruning in context, discussing what happens "behind the scenes" at Japanese nurseries and describing instances of niwaki in private and public gardens worldwide. Throughout the text, illustrations complement the detailed instructions, while photographs and anecdotes bring the ideas surrounding niwaki vividly to life. JAKE HOBSON draws upon years of experience with Japanese gardens and landscaping. He spent a year at a nursery in Osaka, and in 2004 started his own business-Niwaki, Japanese Garden Tools. A keen observer of the artistry of gardens, Jake received his bachelor's degree in sculpture. Niwaki Tip: Books are great, but nothing beats getting stuck in, making a few mistakes, and figuring things out yourself! 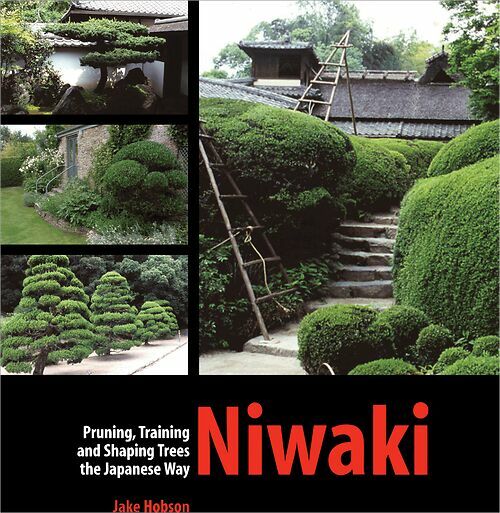 I just had to take a moment to send you a note to compliment you on your fabulous book, "Niwaki: Pruning, Shaping and Training Trees the Japanese Way". I am finding this book fascinating, and for many different reasons. First, it is incredibly informative, and is exactly what I was interested in finding for the landscaping I'm working on for my newly purchased mid-century modern home. But more than that, I find your writing style to be incredibly pleasing. I'm a Professor of the Arts here at the University of North Texas. The stylistic and descriptive choices you make in your prose suggest very plainly that you have a background in the arts. It's eloquent without being stuffy, authoritative without being didactic, and is witty and charming, all the while holding true to the tradition, rigor, and stricture of this art (though it seems that the notion of fluidity is really its only stricture). Usually, when I pick up a "how to" book, I brace myself for stilted writing. I even can overlook the odd grammatical error or two. After all, the "how to" book is utilitarian, not aesthetically intended. Worse yet, however, some authors try failingly to impose a style on their writing in these books that at best comes off as contrived, and at worst, is so silly it forces me to read the book in short spurts so as to not become the blind-to-information and quixotically impotent copy editor. I can't see the "information" trees for the "horrible writing" forest. Such is not the case with this book. You're a wonderful writer, and I find myself trusting your knowledge all the more precisely because of the care that you took with your writing. Again, you write as though you are submitting an entry for a exhibition catalog, not a "how to" book. Thank you so much for this informative text and for all of the loving research you've done. Now off to prune (hopefully not butcher) my first tree, and learn a few things in the process.